The House of Mouse helped the Dow log just a modest dip on one of the final few trading days of 2015. 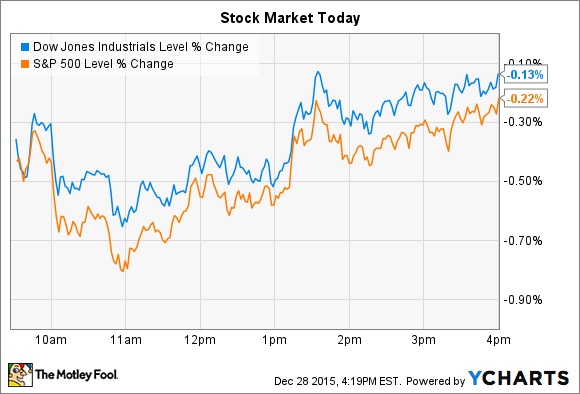 Stocks couldn't quite manage a gain to start the final, shortened, trading week of 2015. Despite climbing for most of the session, indexes ended just barely in the red today. The Dow Jones Industrial Average (DJINDICES:^DJI) lost 24 points, or 0.13%, and the S&P 500 (SNPINDEX:^GSPC) slipped by 4 points, or 0.22%. As for individual stocks, Disney (NYSE:DIS) and Iconix Brand Group (NASDAQ:ICON) each stood out with their performances, but for sharply different reasons. Disney was the best-performing stock in the Dow, rising 1% to bring its year-to-date gain to 14% -- compared to a flat overall market. The uptick came as investors digested news that Star Wars: The Force Awakens required just 12 days to pass $1 billion in box office receipts. That was a faster pace than it took Jurassic World to hit the $1 billion mark, which puts Disney's film on top as the quickest movie to ever reach that figure. And The Force Awakens still has another major country left to visit: China, the world's second-biggest movie market will be introduced to the Star Wars franchise for the first time ever, beginning next week. In August, Disney executives had tried to tamp investors' expectations down for this film, saying, "We just want to be careful here that the market doesn't get too far ahead of itself" on revenue projections. It had been a decade since the franchise was tested in domestic theaters, after all, and many markets outside of the U.S. weren't very familiar with the saga. Yet the early box-office results suggest those worries were overblown. The Force Awakens appears set to become one of the most successful films to date. Of course, that's just where things get started for an entertainment conglomerate like Disney. "We fully expect that the success of this film will reverberate throughout the company not only in 2016 but in the years," CEO Bob Iger recently told investors. "We have probably the most viable film franchise that ever existed, and we know we have the ability to leverage it in compelling ways, whether it's in [video games], theme parks, consumer products, or on the TV front," he said. 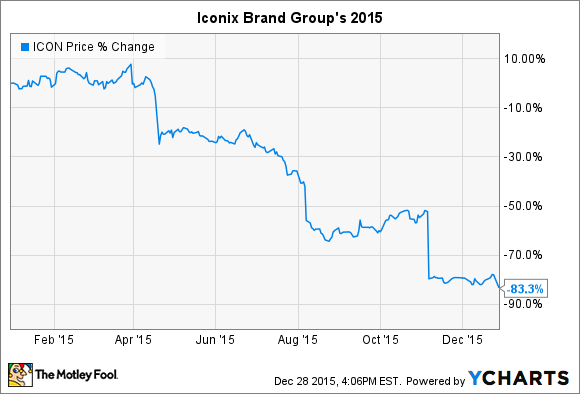 Meanwhile, Iconix Brand Group, the owner of over 30 global consumer brands including London Fog, Umbro, and Sharper Image, saw its stock plunge 24% today. The drop added to a stunning collapse for shares -- over 80% in 2015. The dip came in response to news of accounting issues that call into question many of the numbers that investors have relied on in financial statements ranging back to 2013. Iconix revealed today that the U.S. Securities and Exchange Commission has launched a formal investigation into its accounting practices, despite the company having recently restated every quarterly result since the fourth quarter of 2013. Management tried to reassure investors that its liquidity is not at risk despite weakening operating results and more than $1 billion in long-term debt. The company is "in active discussions with potential lenders and continues to expect to be in a position to refinance its 2016 convertible notes," executives said in a press release. Still, investors are likely choosing to exit their positions rather than wait to see what other accounting issues the SEC may uncover in its review.